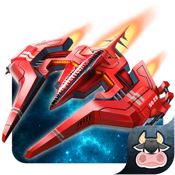 ***** The newest Space Combat RPG Game on iPad***** ***** Thousands of players fighting from assorted devices ***** Andromeda 5 is a galaxy without a ruler. Few have entered and left alive. Even the most daring of mercenaries would deem an expedition here as suicide. Take this as your final warning before you enter the galaxy of Andromeda 5… Explore the beautiful and mysterious galaxy of Andromeda 5, with more than 20+ other galaxies available. Fight anyone from harmless freelancers, traders, and droids, to the deadliest of pirates, assassins and battlecruisers! Choose between 15 different ships and upgrade them with your own weapons and skins. Earn rewards by completing heroic missions - then optimize your ship into the perfect killing machine! Key facts and Game features: • Sci-Fi MMORPG • Epic battles in open space between thousands of players • Thrilling and intensive gameplay • Engaging storyline and rewarding quest chains • Challenging PvP mode against multiple teams • Choice to team up with friends and complete missions together • Extra challenges from hidden galaxies via wormholes • Extraction Points: giant player controlled mining stations in open space • Special galaxies unlocked by harvesting rare parts • Two factions in constant warfare for control of the galaxy!